According to the legends of the Coeur d’ A’lene people of northwest Idaho, giants were common on their lands at one time. They were described as having a strong odor, “like that of a burning horn.” Their faces were black and they were as tall as a tipi. The giants would often approach a solitary tipi or lodge, but if several dwellings were grouped together they were not so bold. The giants were said to dress in bear or other animal skins with the hair left on. They lived in caves and had a great liking for fish. So much so, that according to the old stories, these giants often stole fish out of the Coeur d’ A’lene traps. 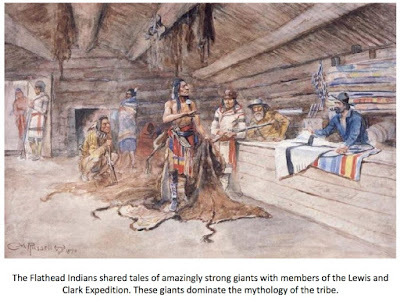 Other than the curious examination of solitary tipis or lodges and the occasional theft of fish from Indian traps, the giants were said not to bother people much. The Coeur d’ A’lene did acknowledge hearing stories from other tribes of women being stolen by the giants, but had no tradition of kidnapping tales in their lands. The accounts of these giants in the mythology of the Coeur d’ A’lene people sound as if they came right out of a sasquatch 101 textbook. The giants reportedly had a “strong odor like that of a burning horn.” I admit that I am unfamiliar with what a burning horn might smell like, but witnesses over the years have repeatedly commented on the terrible stench emitted by wood apes. The description of a creature with a dark face closely matches most reports given by witnesses today. Almost all witnesses who report getting a good look at a sasquatch have described a creature that has dark skin (even if the hair on it is lighter in color). The Coeur d’ A’lene belief that these giants had an affinity for fish and stole them out of traps is something I have heard from the stories of other native tribes. In addition, wood apes have often been reported in or near water, perhaps in an effort to catch fish. None other than Bob Gimlin said that when he and Roger Patterson rode up on the sasquatch that would become known as Patty, she was crouched down on the edge of the water of Bluff Creek, possibly trying to catch a fish. Too, the behavior of these giants sneaking up close to isolated dwellings matches up to modern reports. It is the very reason many researchers today will move their tent away from base camp when out in the field. It is generally believed that these apes are more likely to approach an individual tent than a walk into a camp with several. 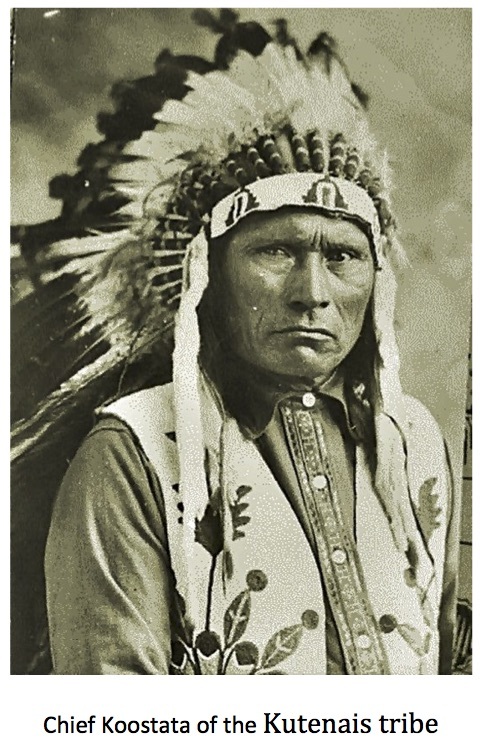 Finally, the Coeur d’ A’lene people alluded to having heard stories of these giants kidnapping women on occasion from other tribes. There is a strong tradition of the kidnapping of women and children by these creatures in the lore of many Native American tribes. Truth be told, it is something that is still whispered about by some researchers to this very day. Critics might point out a discrepancy between the beliefs of the Coeur d’ A’lene and modern reports, that discrepancy being that these giants allegedly wore the skins of other animals. Reports along these lines are so rare as to be practically nonexistent today. Regardless, I am not so sure this is much of a discrepancy. The Coeur d’ A’lene did describe these giants as wearing “bear or other animal skins," however, and that these skins had “the hair left on.” Is it not possible that these Indians, because the giants they were seeing were bipedal and, therefore, in their minds, had to have been some kind of human, might really have been seeing a hair-covered creature? 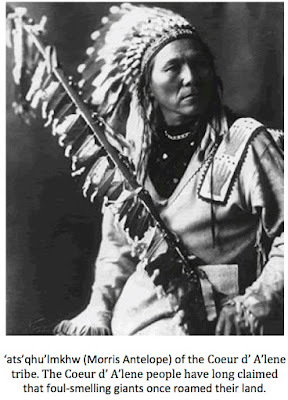 Source: Clark, Ella E. Indian Legends from the Northern Rockies. Univ. of Oklahoma Press, 1977.